Chances are, most of us have experienced shoulder pain at some point and are looking for relief. Whether our aches developed from poor posture, reckless movement, or something more serious, the pain of such an active and important part of the body deters us from reaching, shifting in place, and even sitting up straight. Anyone, at any age, can develop issues in the shoulder, as the soft tissues of the area begins to break down. Depending on cause and treatment, pain may be felt in a specific part of the shoulder or the entire area, or spread down the arm. Beyond basic causes like poor sleep and posture, shoulder pain can come from a rotator cuff injury, bursitis, a broken collarbone, dislocation, or osteoarthritis. Frozen Shoulder and tendinitis are also common causes of shoulder pain. If the pain and debilitation in the shoulder is minor, a doctor will most likely recommend the usual at-home treatments for joint pain: rest, ice and heat, and over-the-counter medications. If more serious symptoms arise – such as sudden swelling, increased tenderness or intense pain – prescription medication and steroidal injections can ease inflammation and pain. If an individual is experiencing serious shoulder pain, doctors may prescribe medications that contain opiates such as codeine and dihydrocodeine (“weak” opioids), or tramadol, methadone, or morphine (“strong” opioids). Once these medications enter the body, they work to interrupt the pain signals sent to the brain, thereby dampening the sensation of pain. Over time, opioid use leads the body to rely on these externally introduced painkillers, and cut back on production of natural pain-relieving compounds. As a result, the body requires more opioid medication to make up the difference. This reliance on pharmaceutical medication does more than raise the individual’s risk of addiction or over-dose, it also appears to affect the pituitary gland and hypothalamus, and cause fatigue, obesity, depression, and decreased libido – to name only a few side effects. Even over-the-counter options like ibuprofen can cause liver damage if used for extended periods of time. Cannabis not only relieves shoulder pain, it also helps the endocrine system re-normalize, reversing the side effects of other medications. Depending on your symptoms, different methods of consumption may be beneficial. 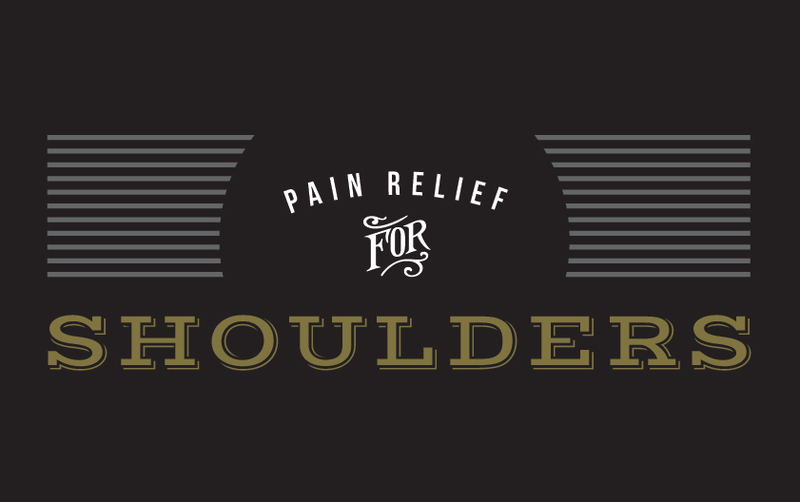 For shoulder pain, FARM recommends starting with a topical application of cannabis that is non-psychoactive. For example, a topical balm or lotion. Whichever method you choose, cannabis offers a host of benefits similar to prescription medications, without the risk of overdose, and with few negative side effects. Cannabis contains compounds called cannabinoids. These compounds can bind with the body’s existing endocannabinoid system because they are very similar in design to the endocannabinoids our body naturally creates. When endocannabinoids and neurotransmitters are underproduced due to medication or illness, cannabinoids step up to fill in. THC is the most prevalent and well-known compound of more than 80 others within the cannabis plant. While it’s true the psychoactive “high” caused by THC (though not topicals) might make you forget your pain for a time, there is a lot more to the inner workings of this multi-purpose plant. By pairing up with endocannabinoid CB receptors in the body, THC and another cannabinoid called CBD (cannabidiol) work together to ease pain, reverse inflammation, and even protect nerves and cells from future damage. By regulating the immune system, cannabis soothes the body away from over-reaction to certain stimuli by reducing inflammatory response. This effect appears to be owed to CBD and another non-psychoactive cannabinoid called Caryophyllene (or β-Caryophyllene). Caryophyllene is a “terpene” – terpenes are a large and diverse class of organic compounds which are produced by a variety of plants, particularly conifers. Terpenes are the primary constituents of the essential oils of many types of plants and flowers. Essential oils are often used in alternative medicine for aromatherapy. Caryophyllene is a terpene that exists not only in Cannabis, but also in other plants and spices such as cloves, rosemary, and hops. Another way cannabis helps with pain and healing is by inducing sleep. Certain strains – primarily indica-dominant strains with a high level of THC – provide deep relaxation. A lack of pain sensation coupled with a sedative effect enables individuals to fall and remain asleep throughout the night, speeding healing and making one feel better in general. CBD and stimulating sativa strains offer the opposite effect, invigorating individuals whose energy might be sapped by pain and fatigue. Whatever the cause of your shoulder pain, FARM staff can help you discover the perfect product so you find relief from shoulder pain. The ideal flower or topical for your individual ailment can most certainly be found in our wide selection of fresh, quality medication.